​​Dr. Jocelyn Cowan joined the UAH veterinary team in 2004, providing outstanding patient care and performing surgery. "Meeting clients and their companions is one of the great parts of my job. Knowing that I help owners keep their pets safe, healthy and comfortable is a feeling beyond compare". Dr. Cowan completed a Bachelor of Arts in Natural Science and Mathematical Science at Johns Hopkins University. She earned her DVM at Tufts University School of Veterinary Medicine. 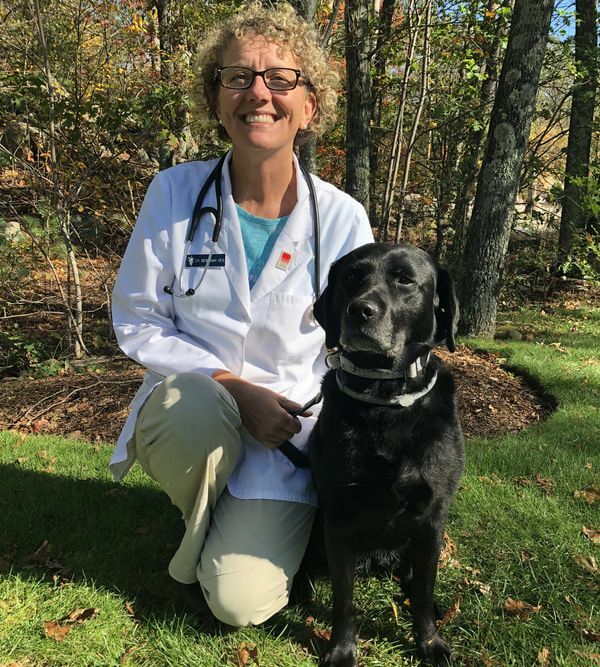 After finishing veterinary school, Dr. Cowan completed an internship in emergency medicine at Norwalk Veterinary Referral Emergency Center and worked 3 years as an emergency clinician at Ocean State Veterinary Specialists. Dr. Cowan lives in Whitinsville with her husband, their two boys; dogs, Rhona (a South African Boerboel, pictured) and Merida (a Boerboel and Presa Cross) and free range chickens. Dr. Deborah Veo joined UAH in 2002. Dr. Veo is responsible for providing outstanding patient care and performing surgery. Dr. Veo demonstrates an unmatched level of compassion towards her clients and their pets. Dr. Veo received a Bachelor of Arts degree in Biology and Chemistry from Salem State College and a Master's degree in Education from Tufts University. She received her DVM from Tufts University School of Veterinary Medicine. Upon finishing veterinary school, Dr. Veo completed an internship in medicine and surgery at Angell Memorial Animal Hospital in Boston. A resident of Upton, MA, Dr. Veo is the proud parent of her dog, Aspen (pictured). Dr. Vincent joined the practice in October 2016. She received a Bachelor of Science degree in Biology and Biotechnology from WPI. 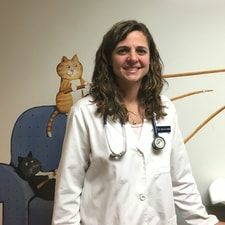 Dr. Vincent worked as a Veterinary Technician for 7 years prior to earning her DVM at Tufts University School of Veterinary Medicine in 2014, after which time she practiced locally in the Worcester area before joining our team. Dr. Vincent, who has a special interest in Dermatology, is responsible for providing outstanding patient care and performing surgery. Dr. Vincent lives in Grafton, and when she's not at UAH, she enjoys, reading, swimming, yoga, traveling, baking and spending time with her family and four cats; Oliver, Orange, Fiona and Owen! Dr. Ali O’Hagan joined our team in April 2018. Dr. O'Hagan is a 2007 graduate of Tufts Cummings School of Veterinary Medicine. Upon graduation, she completed a medical and surgical internship at VCA South Shore and has been practicing medicine in the area for the last 10 years. 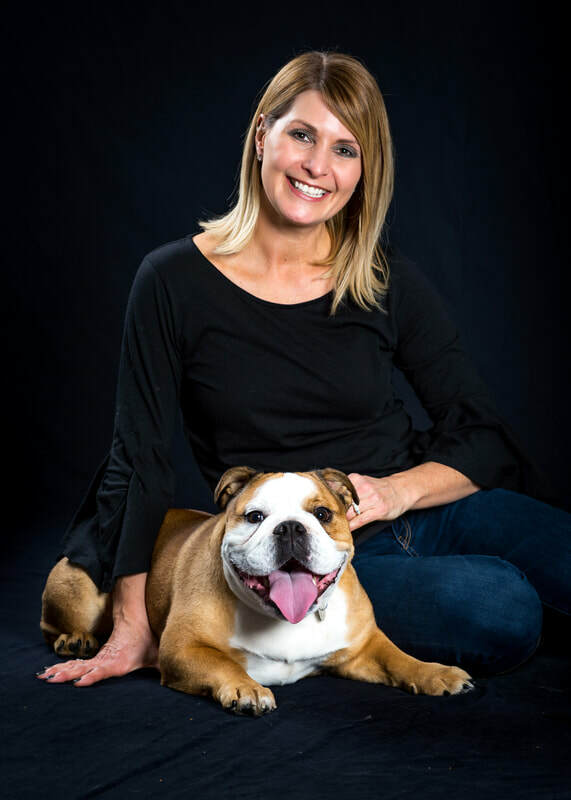 Professionally, she enjoys all aspects of veterinary medicine, and takes pride in the relationships she builds with her clients while helping to care for their pets. Born and raised in New Jersey, Ali is still a Jersey girl at heart and cherishes any time she gets to spend at the Jersey Shore with her friends and family. She currently resides in Pomfret, CT and shares her home with her rambunctious boys, Theo and Finn, and her misbehaved dogs, Karma and Cowboy. When she’s not a mom or a veterinarian, Ali enjoys a nice quiet walk in the woods with her dogs. ​Dr. Miles joined UAH in 2012. 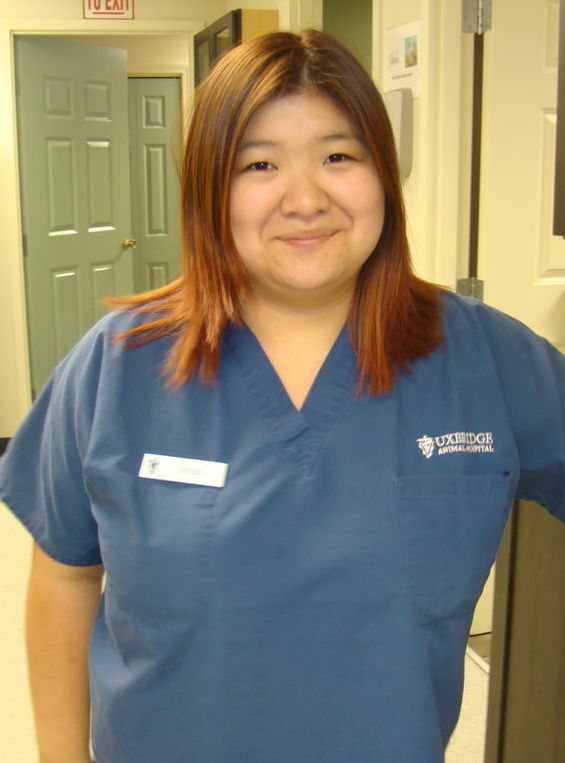 She now works Thursdays at Uxbridge providing acupuncture and chiropractic services to our patients. Dr. Miles received a Bachelors of Science in Biology from University of California, San Diego. She earned her DVM from Tufts University School of Veterinary Medicine in 2010. After finishing veterinary school, Dr. Miles completed an internship in medicine and surgery at Veterinary Medical and Surgical Group in Ventura, California. In 2015, Dr. Miles completed her animal chiropractic certification at Options for Animals in Kansas. 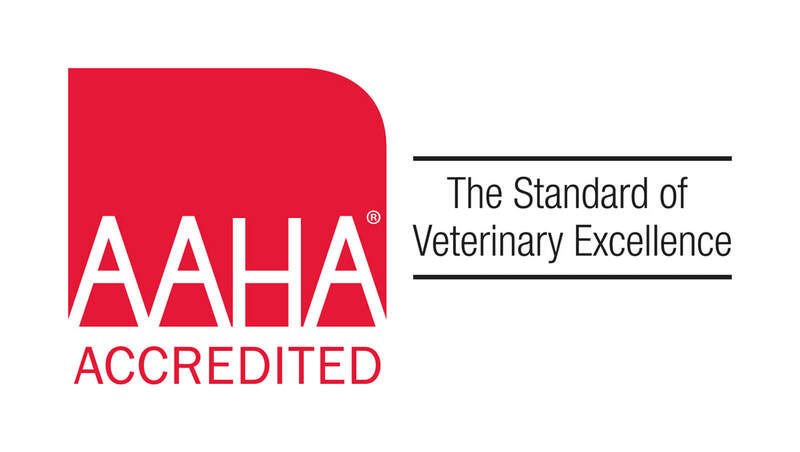 She was board certified by the International Veterinary Chiropractic Association. In 2016, she began her studies in acupuncture at the Chi Institute in Florida. She completed her basic acupuncture courses in the summer of 2016 but is continuing her education in Traditional Chinese Veterinary Medicine. Dr. Miles lives in North Grafton with her boyfriend, two pugs, Milo and Egor, and a 100 gallon freshwater fish tank. She also enjoys hiking, running, and mountain biking. Kim joined UAH in 2011 after making a career change. She received her Bachelor of Science in Chemical Engineering at Rensselaer Polytechnic Institute, and after 13 years in the engineering field she decided to make a change which allowed her to work alongside like-minded people who share her love and compassion for animals. Kim is responsible for the hospital's accounting, human resources, technical support, staff management and building maintenance. She also supports the doctors and staff in various other ways. Kim lives in Sutton with her husband and daughter along with their bulldog, Téa (pictured), their cat Koosh and 4 chickens! When Kim is not at UAH she enjoys running, writing, serving in her church, and spending time with her family! ﻿Christy graduated from Cornell University with a degree in animal science. Prior to joining the UAH team, Christy worked for 7 years as a zookeeper at Roger Williams Park Zoo in Providence, RI! She joined UAH in 2008, starting as a veterinary assistant, then achieving her certification in 2013. Christy assists the doctors in everything from exam rooms to monitoring anesthesia during surgical procedures. She also co-manages the UAH staff. Since 2009 Christy has also managed the hospital's inventory. 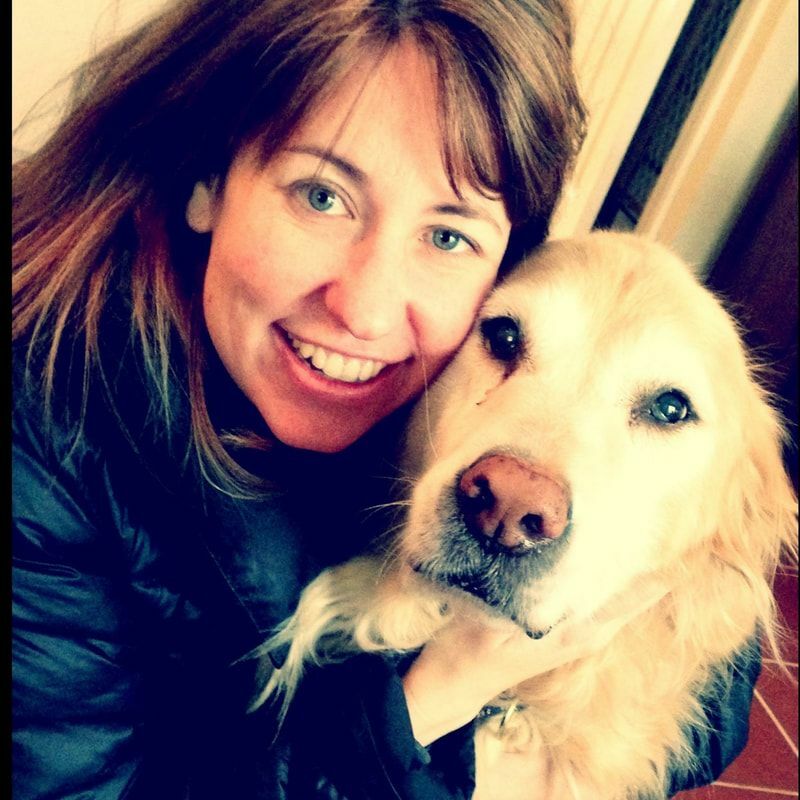 ​Renee is one of our Certified Veterinary Technicians and one of our Working Supervisors. She has been a part of our team since 2009! As one of the lead techs at UAH, she is in charge of training staff, anesthesia monitoring during surgery and assiting the veterinarians with office visits, blood draws, vaccinations and radiographs. Renee also co-manages the UAH staff. Renee currently lives with her husband, two children and two cats, O'Malley and Agnes, in North Smithfield, RI. Jessica joined our team in 2012! As a Certified Veterinary Technician, Jess helps set up appointments, assists the veterinarians in office visits, draws blood and assists with radiographs. Jess, is a 2018 pre-vet graduate of Becker College and is planning to go onto Vet School! She is passionate about the One Health Initiative. In her free time Jess enjoys K-pop, traveling and spending time with her husband and fur babies. Jess lives in Northbridge with her husband, their three dogs, Snap, Velcro and Zipper; and their two cats, Laces and Stitch. 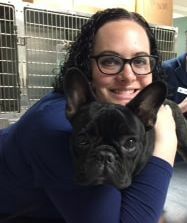 A Certified Veterinary Technician, Breanna joined our team in April of 2018. 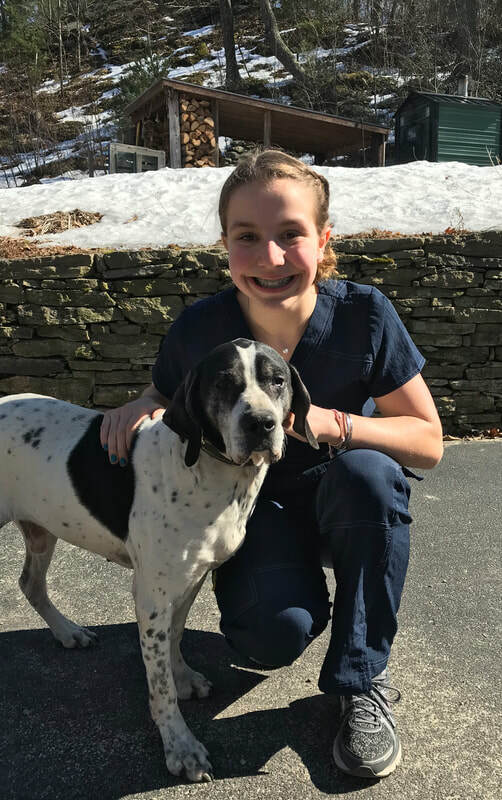 A graduate of Mount Ida College, Breanna helps set up appointments, assists the veterinarians in office visits, draws blood and assists with radiographs. In her free time Breanna enjoys spending time outdoors, snowmobiling, water skiing, jet skiing and hiking with her dogs; April (left) and Murphy (right). Breanna lives in Upton with her two dogs and her cat Millie. Kelly is one of our veterinary technicians. She helps set up appointments, assists the veterinarians in office visits as well as during surgery, draws blood and assists with radiographs. Kelly also manages our Facebook and Instagram pages! Kelly lives on Roughbroke Farm in Uxbridge with her daughter and husband, her dog, 2 cats, and a variety of farm animals. She and her husband raise Nigerian Dwarf goats! Jacqueline who has worked locally in the field for the past 10 years, joined our team in November 2017 as a Veterinary Technician. Jacqueline graduated from Worcester State University with a BS in Behavioral Science and Elementary Education, and is also Fear Free Certified. Jacqueline helps set up appointments, assists the veterinarians in office visits as well as during surgery (including monitoring anesthesia during surgical procedures), draws blood and assists with radiographs. She has special interests in dental prophy and radiography, education, behavior and surgery. When she's not working Jackie loves hiking, traveling, painting, gardening, cooking, BBQ's, bonfires, beach days, road trips and spending time with her family and friends. Jackie lives in Pascoag, RI with her two daughters; Rhyan and Darcy, their two cats; Friday and Cricket and 3 goats; Teddy Spaghetti, Noodles and Ravioli! Hailey is one of our veterinary assistants. Hailey helps set up appointments, assists the veterinarians in office visits, and assists with radiographs. Hailey lives in Northbridge with her family, three dogs; Elvis, Toby and Gracie (pictured), and her cat, Leon! Jamee assists our surgical staff by preparing our surgical suit for the day, cleaning and organizing surgical equipment, and caring for our hospitalized and surgical patients by keeping them comfortable and happy during their stay. She also helps technicians with restraint, nail trims, radio graphs and running in-house bloodwork. Jamee is an Animal Science graduate of Norfolk County Agricultural High School and earned her Associates Degree in Animal Care from Becker College in 2012. Jamee lives in Upton and when not at UAH Jamee is spending most of her time on her family’s farm where she raises and shows dairy goats, rides horses, cares for her two dogs, and volunteers for the local 4-H clubs and events. Megan joined our team in February of 2018 as a Veterinary Technician. Megan who has a BS in Animal Science, from the University of Rhode Island, is also a Certified Chiropractic Assistant. Megan helps set up appointments, assists the veterinarians in office visits, draws blood and assists with radiographs. Prior to joining our team, Megan gained experience while working at a Veterinary Emergency Room. In addition she was also an education/animal care intern at the Southwick Zoo. Megan loves nature/wildlife, music and learning! She lives in Northbridge with her rescue pit bull mix, Axl; her cat, Gronk; and her rabbit, Stella! Kaylie joined our team in November of 2018 but has worked in the veterinary field for over 3 years. As a UAH Veterinary Tech, Kaylie helps set up appointments, assists the veterinarians in office visits, draws blood and assists with radiographs. Kaylie currently attends Worcester State University where she is studying Biology. She previously studied training at Catch Canine Academy. In her free time, Kaylie enjoys Comic-Cons and traveling. Kaylie has been to Germany, Czech Republic and New Zealand! Kaylie lives in Millbury with her 3 cats; Groot, Cuddles and Bruin and her dog Cedric (pictured)! DJ, a 25-year veteran of the hospital! She is in charge of answering calls, making client appointments, handling inquiries. as well as other administrative tasks. DJ is also responsible for the hospital's quality control and accounts receivable. DJ loves the beach and spending time with her daughter in Nantucket. 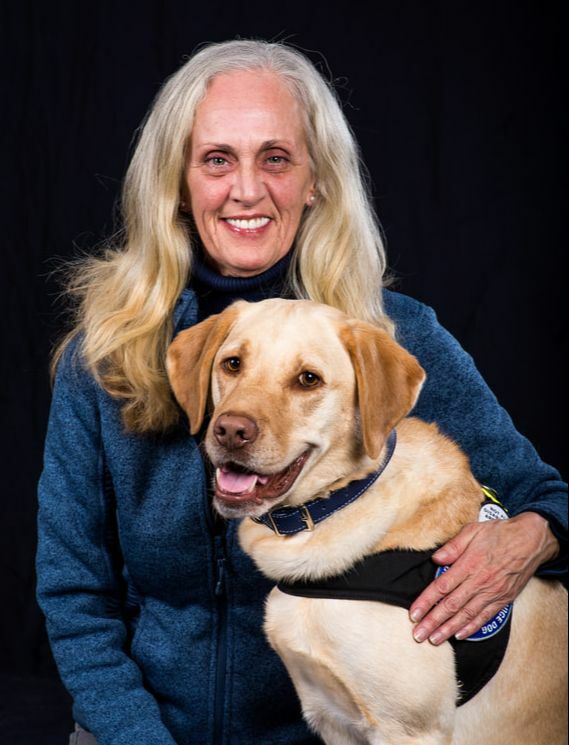 She lives in Uxbridge with her service dog, Squid (pictured). DJ and Squid volunteer at various events throughout the year to help educate children about service dogs! Kelly joined the UAH team in 2012. Kelly is in charge of greeting and assisting clients, answering calls, and scheduling appointments. Kelly assists in many practice administrative duties and is Care Credit certified! Kelly Lives in Whitinsville with her rescue cat, Mimi! ​She is currently pursuing an education in Business Administration. In her free time, Kelly enjoys knitting, singing, making people laugh, and spending time with family and friends. ​As a receptionist at UAH, Joann is in charge of greeting and assisting clients, answering calls, and scheduling appointments. Joann has 20+ years in customer service, in addition to a certificate from Bryant College in Human Resources Management. Joann lives in Uxbridge with her husband, Wayne, their son, and two daughters. Joann loves animals and nature and dedicates her time to caring for her many cats, dogs and farm animals! Danielle joined our team in January 2017. As a receptionist, she is in charge of greeting and assisting clients, answering calls, and scheduling appointments. When Danielle is not at work she enjoys spending time outdoors, hiking, camping and swimming! Danielle lives in Upton with her cat, Salter and her bird, Buddy! Rebekah joined our team in October 2017. Rebekah is in charge of greeting and assisting clients, answering calls, and scheduling appointments. Rebekah graduated from Eastern States University with a B.A. in Entrepreneurship. Rebekah began working with horses when she was just 9 years old and has worked with animals, in some capacity, ever since! In her free time she enjoys cycling, reading, learning, volunteering, spending time with family and serving in her church! Rebekah lives in Uxbridge with her two fur babies, Opal and Gryffindor. ​Lily joined our team in the fall of 2018! As a Kennel Assistant Lily helps keep the treatment area and exam rooms clean and well stocked, assists with laundry and various other tasks to help the staff and patients. Lily attends Sutton High School where she especially enjoys studying science. Lily also trains dogs for hunting and conformation shows! In her free time she enjoys playing volleyball, fishing and spending time with family. Lily lives in Sutton with her family and her dogs; Boston (pictured), Chloe, Cookie, Charm, Dante and Gambler; her cat, Aladdin and chickens!